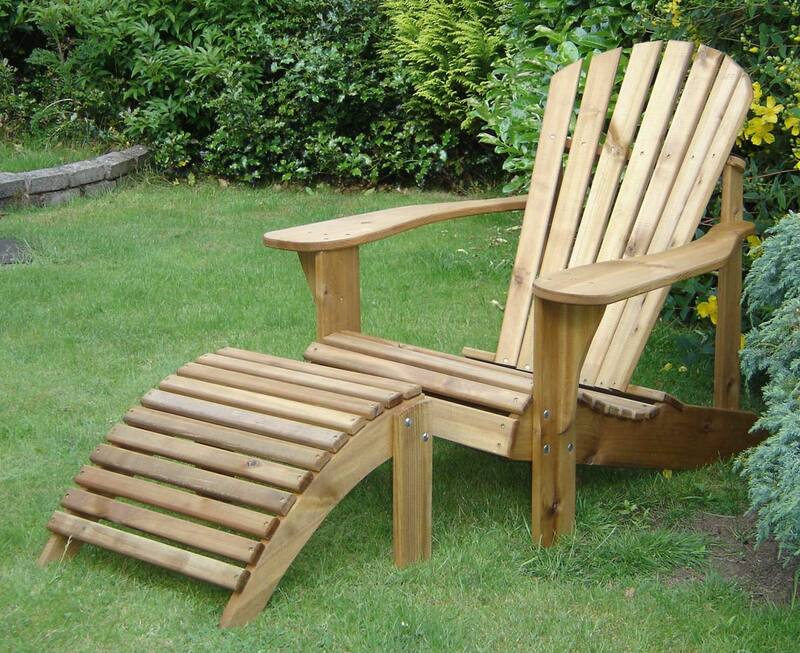 Alfresco Furniture has been making Adirondack chairs for more than 15 years in the UK. 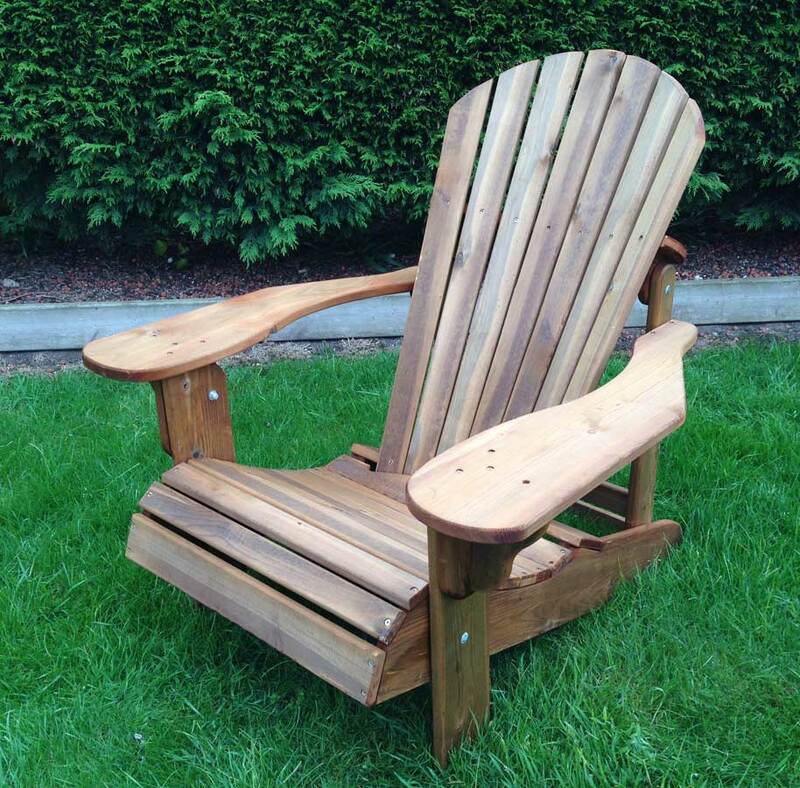 The Adirondack chair is a replica from the original. 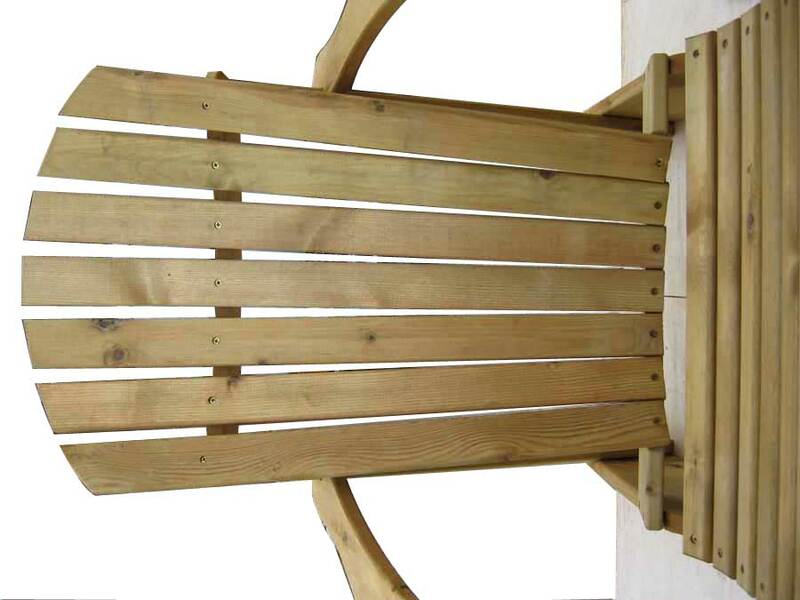 The chairs have become very popular with people who have been across to the states and experienced the comfort of the Adirondack Chair. 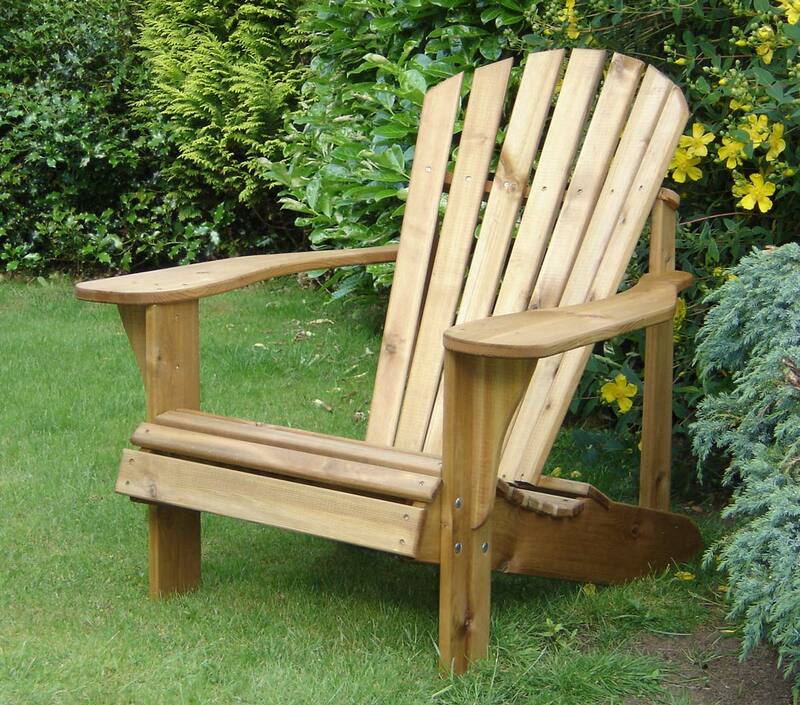 All Chairs are made using Scandinavian Redwood which is then Tanalized which will give the wood a working life of around fifteen years if never treated. Fit bottom back support. 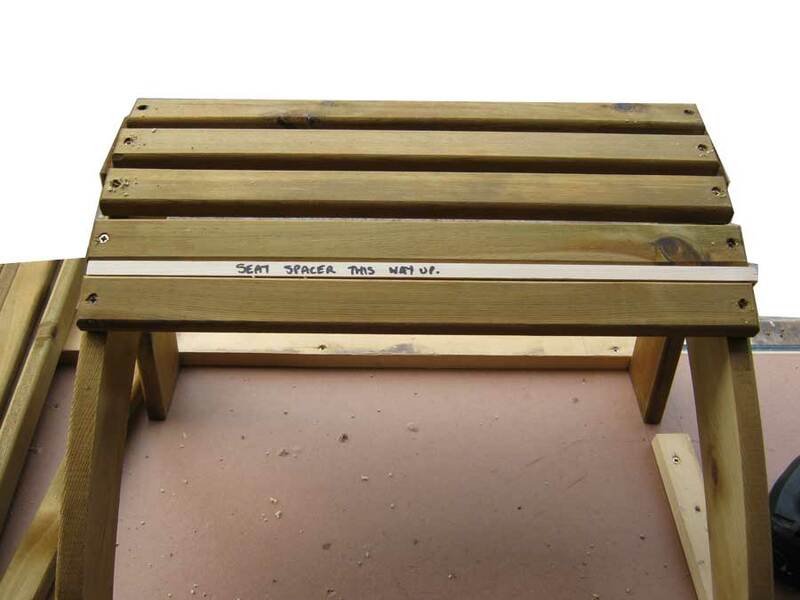 Only put one screw in each side, until seat slats are fitted. 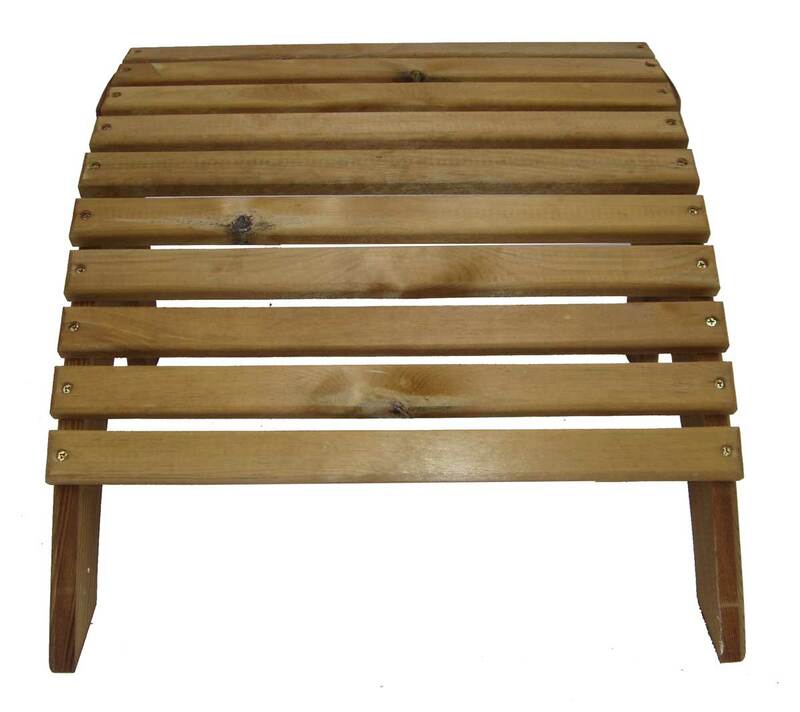 Fit (first) 21" slat in line with leg. 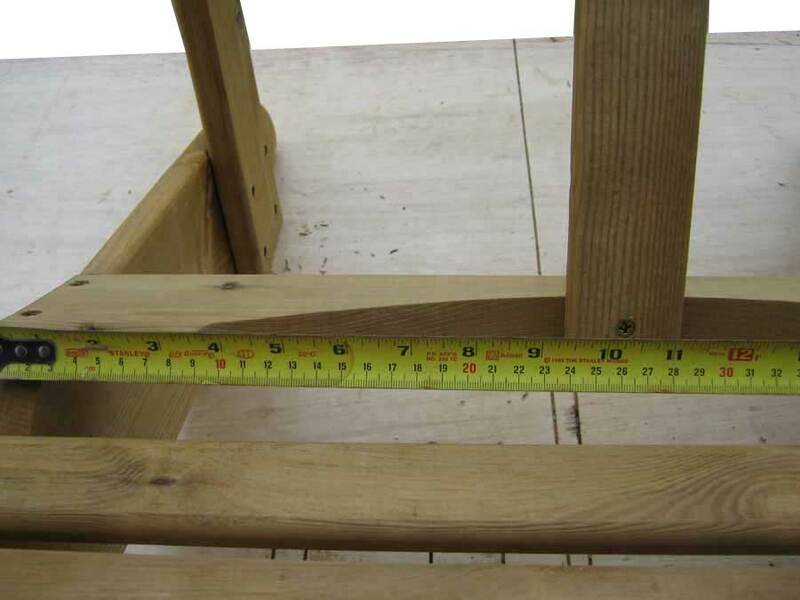 The slat at the bottom is used as a spacer and keeps the legs square while fitting the seat slats. 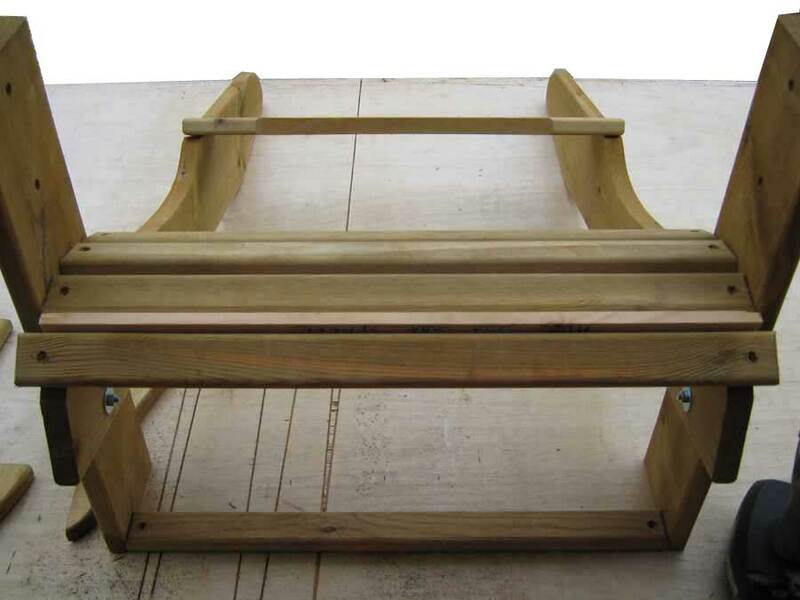 Only fit 2 then fit first 22" slat and seat front. 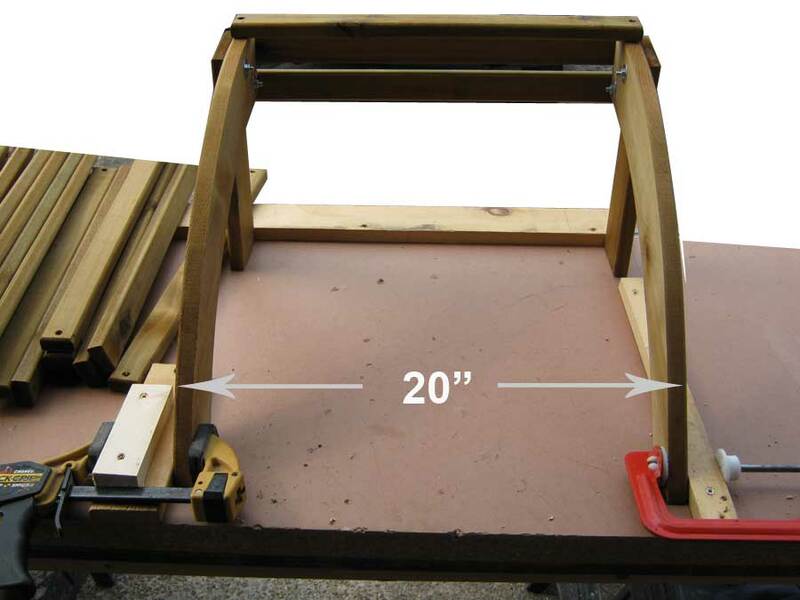 Align the 22" slat so there is even over hang and the hole should be centred on the seat support. Fit front and remove last 21" from between legs and fit. 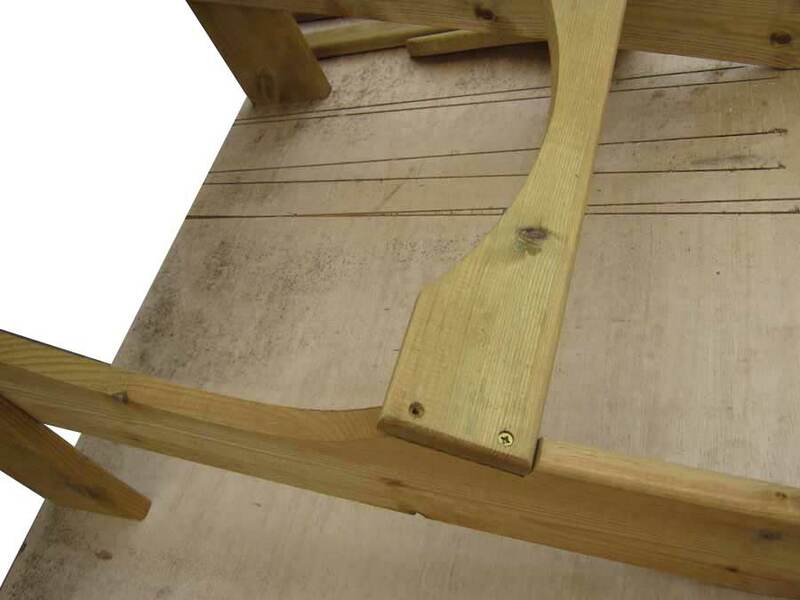 Make sure arm support is square down the chair leg and centred on holes. Fit both arms with one screw only. 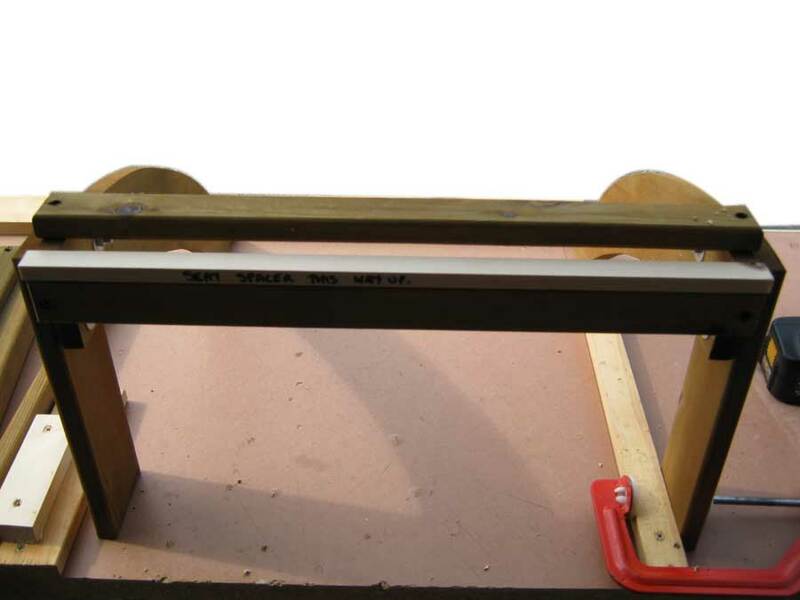 Fit back support, making sure arm fits correctly and back support is square on the floor. 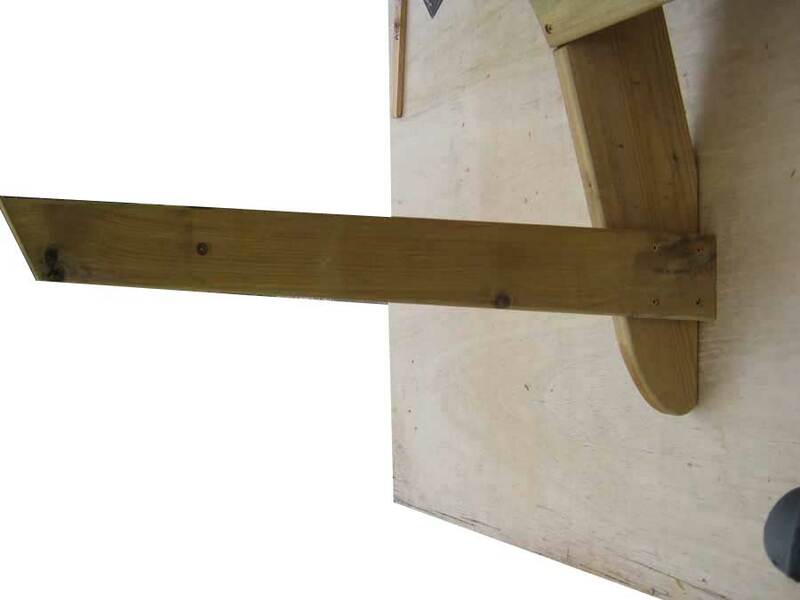 Fit opposite support ready for the top support. Fit top right screw first. 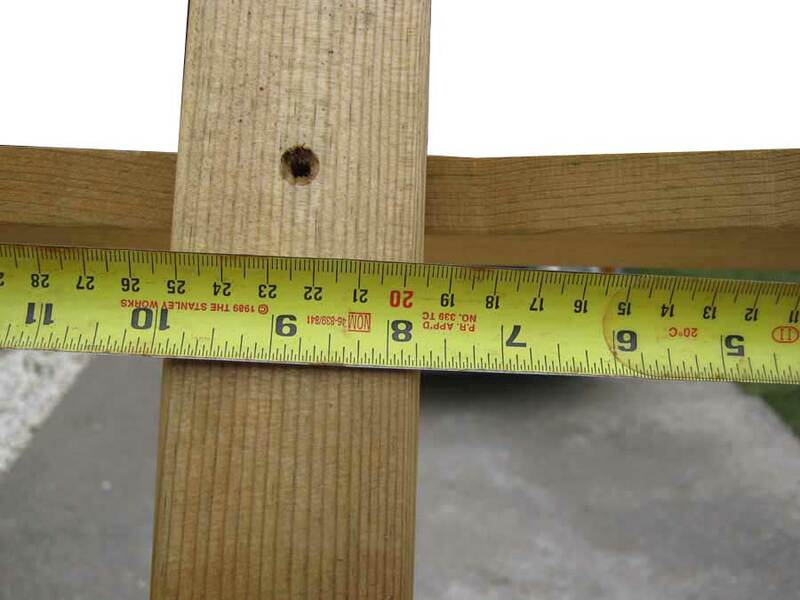 Move into position and drill and screw holes. 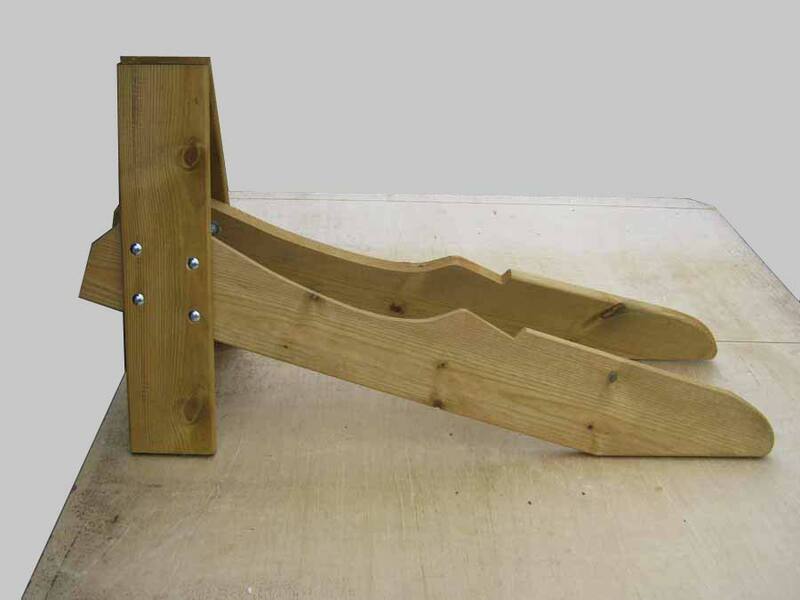 Centre middle back slat bottom and top. 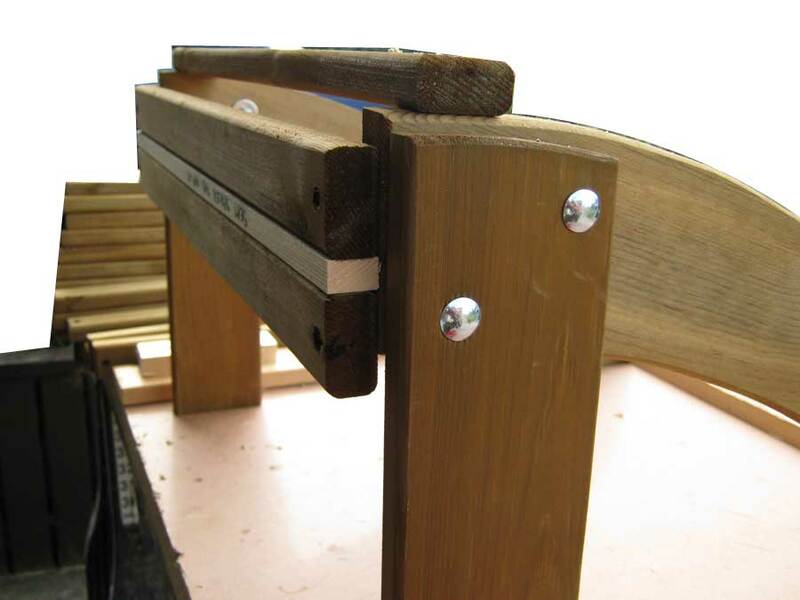 Fit Back Slats with spacer. 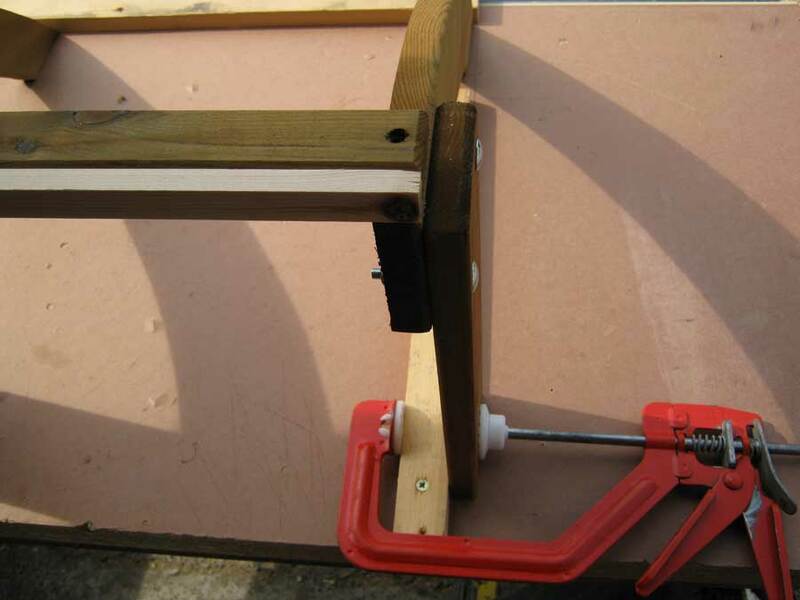 Step one: fixing first slat with spacer. Step two: fixing first back slat with spacer. Step two: side view of lining up back slat with spacer. 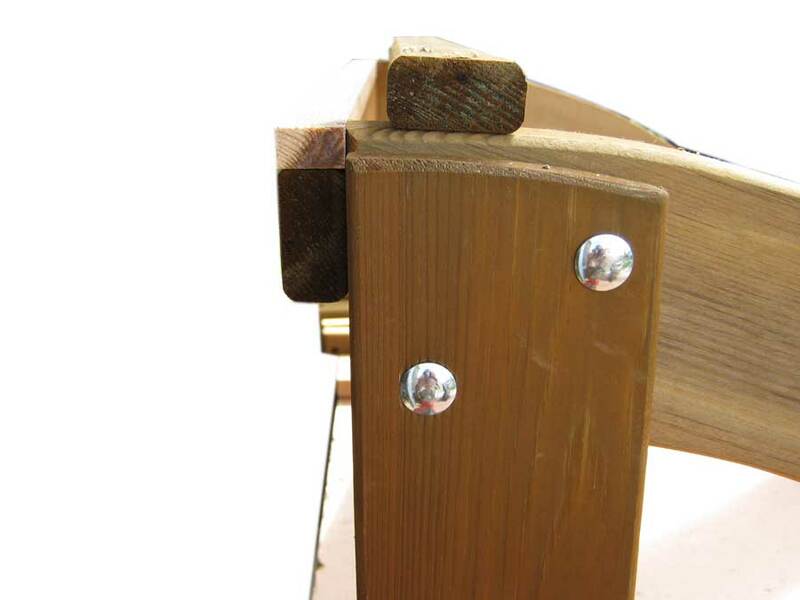 Step three: fixing second back slat with spacer. Step four: fixing make sure the footstool legs are 20” apart at the bottom. 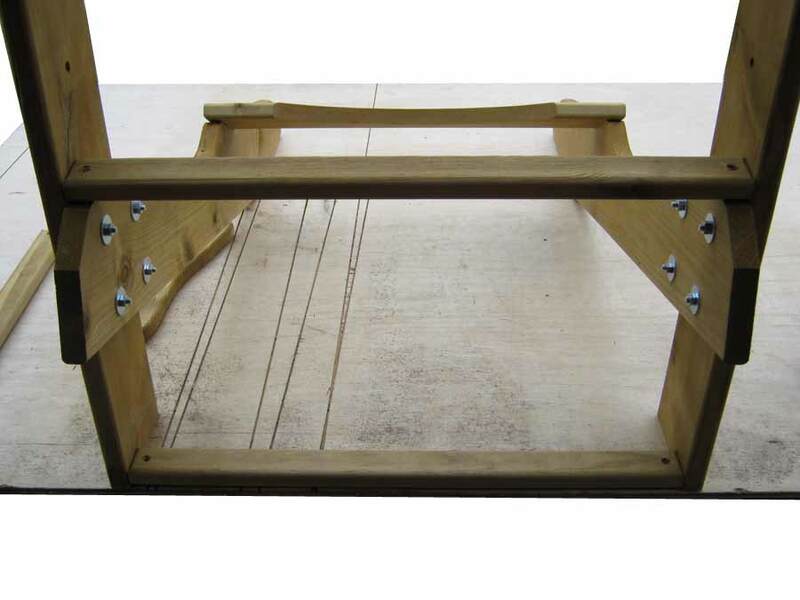 Step five: fixing slats on footstool with spacer until complete. 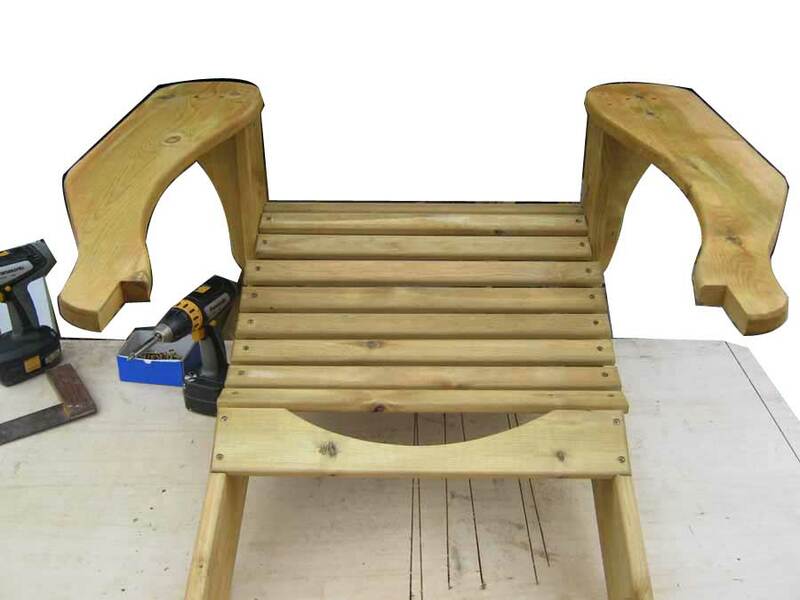 Tanalized Adirondack Chair & Footstool kit. 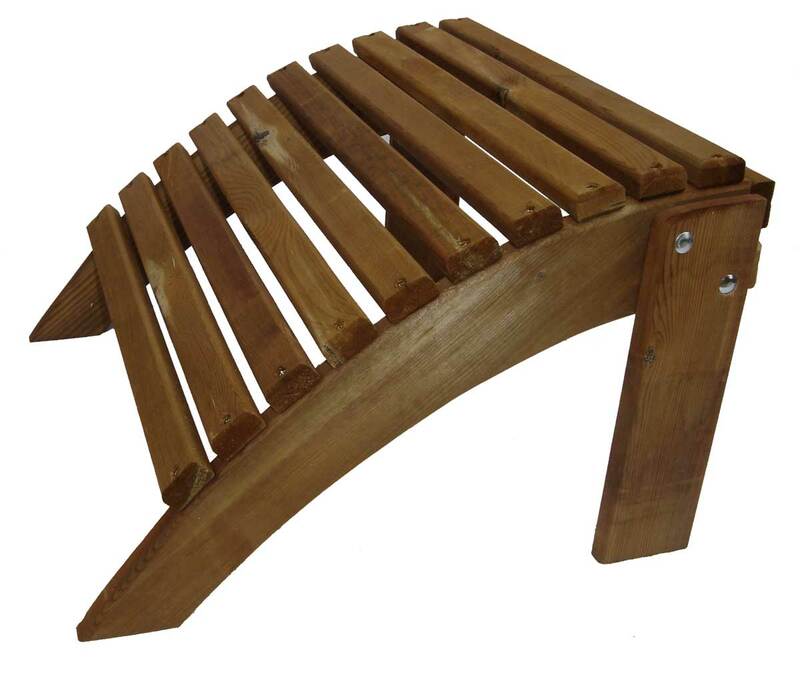 Tanalized footstool kit to match Adirondack Chair. 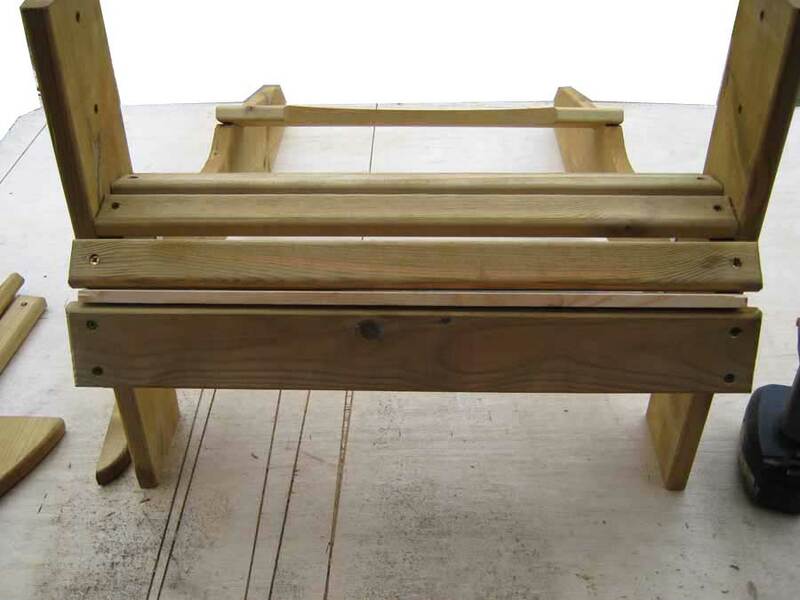 Tanalized footstool to match Adirondack Chair. 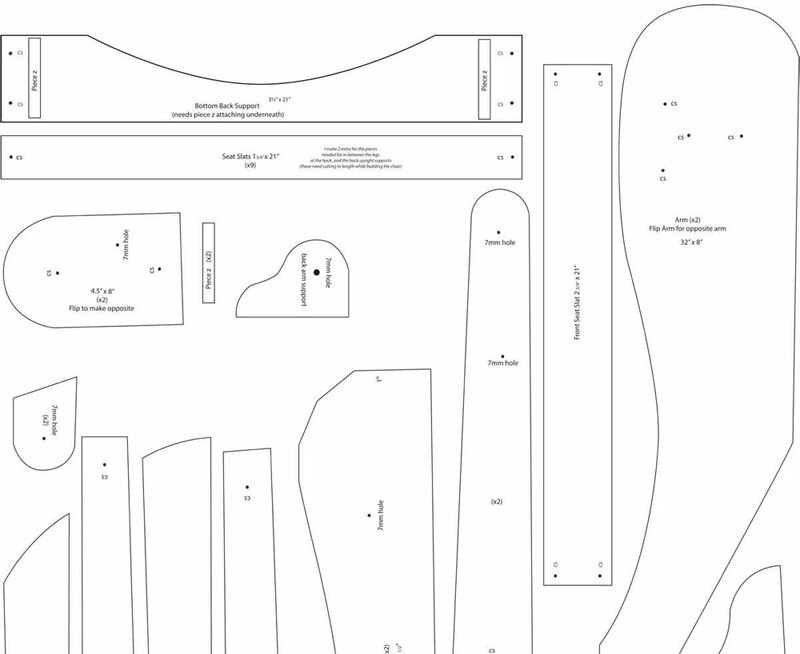 Full size paper plans, ready to cut out and stick with double sided tape(not supplied). 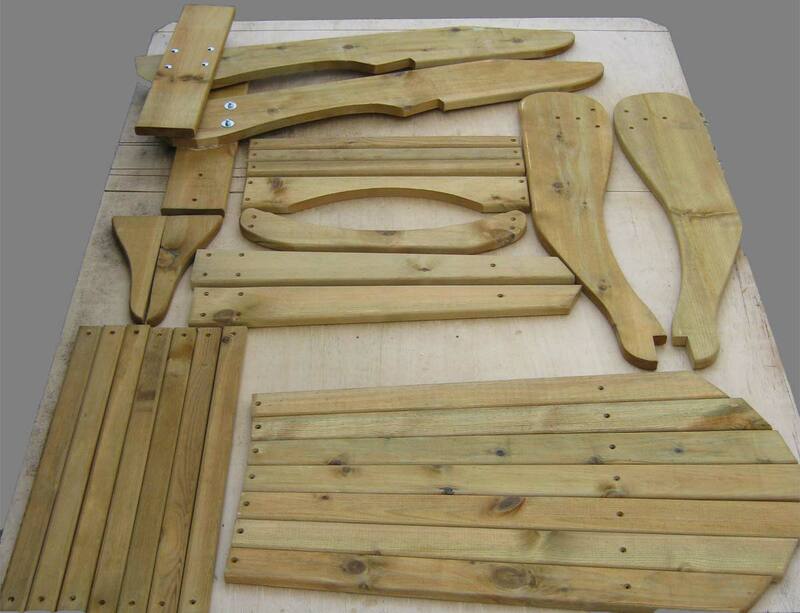 The plans are taken from the templates used to make the chairs. 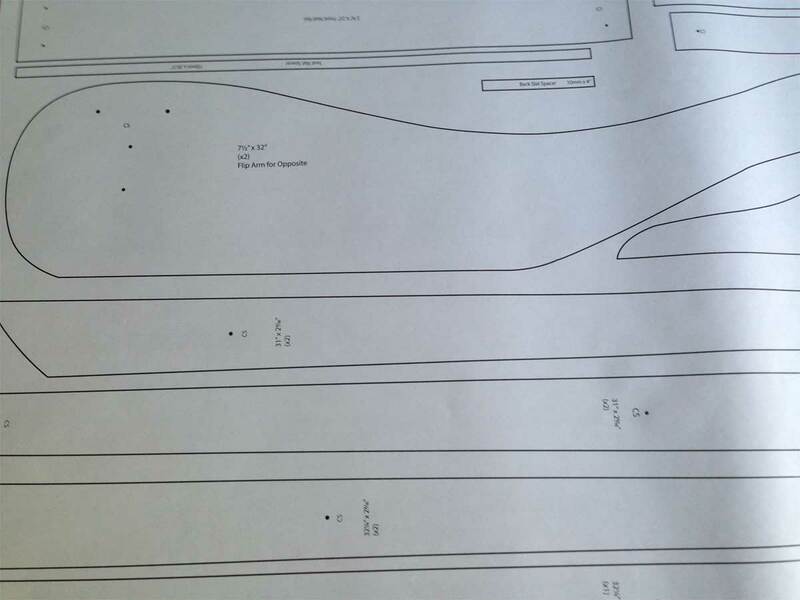 Full size paper plans to cut out and stick with double sided tape(not supplied). 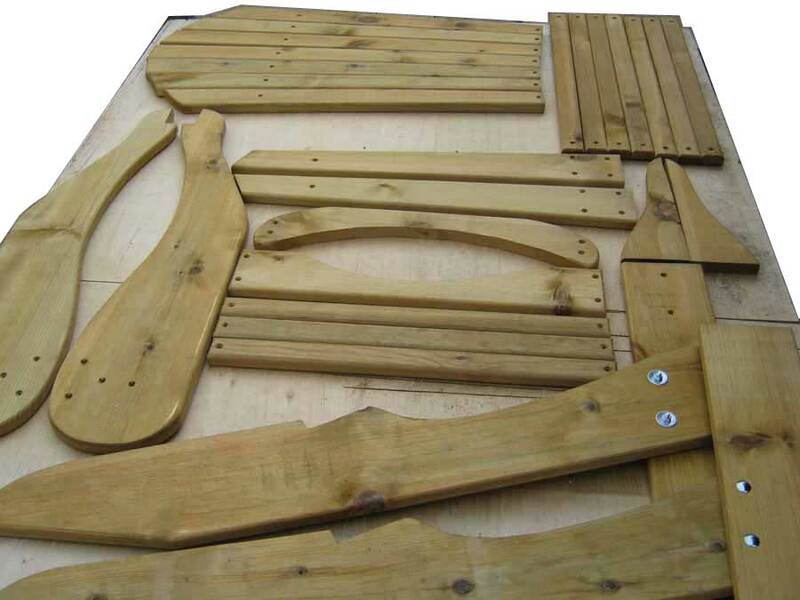 The plans are taken from the templates used to make the Adirondack Bench. 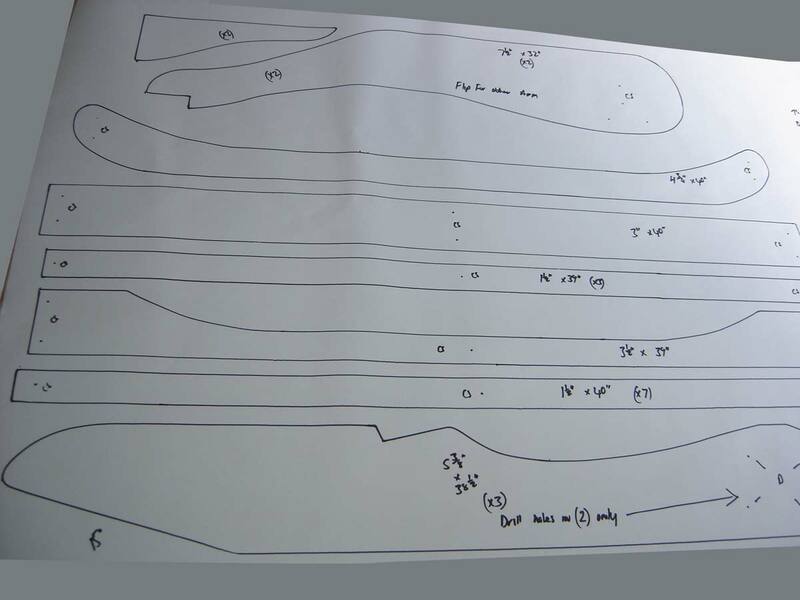 Full size paper plans to cut out and stick with double sided tape(not supplied). 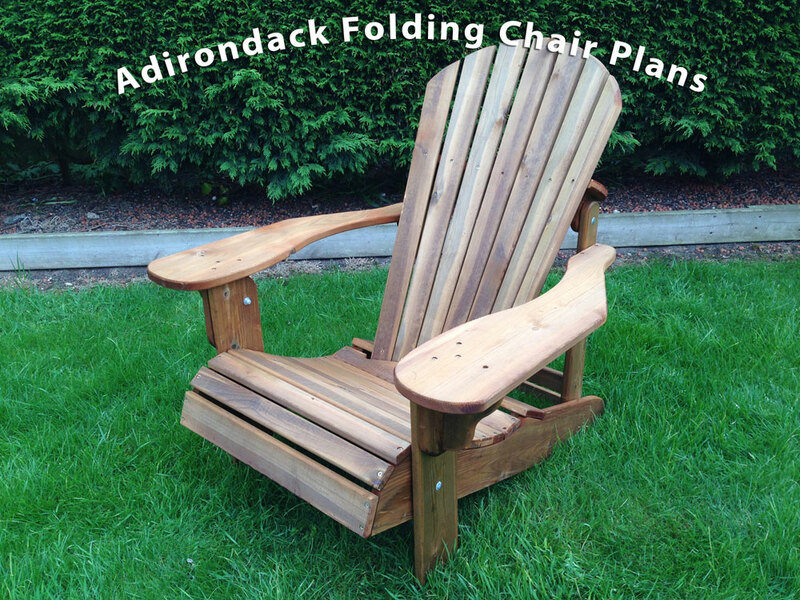 The plans are taken from the templates used to make the Adirondack Folding Chair. 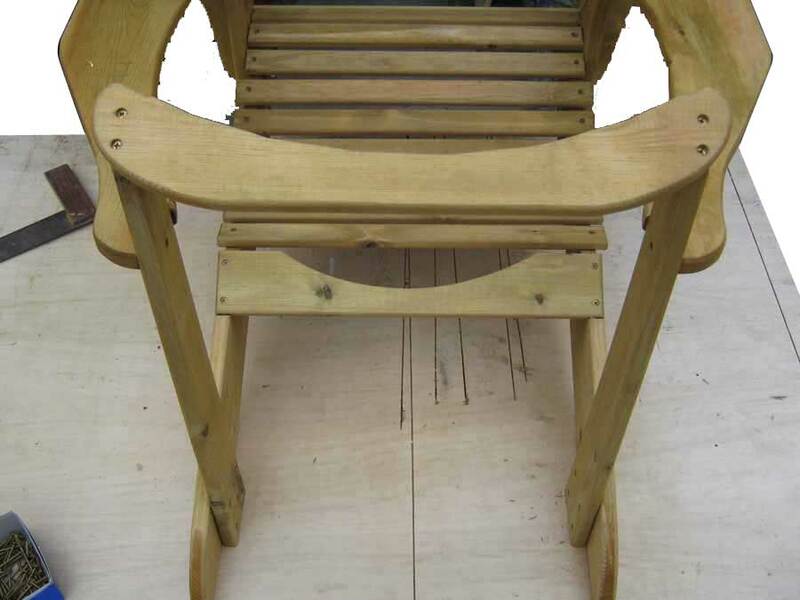 An exact copy of the Adirondack Chair that folds for easy storage. If you have any questions please get in touch and I will include it in the list. 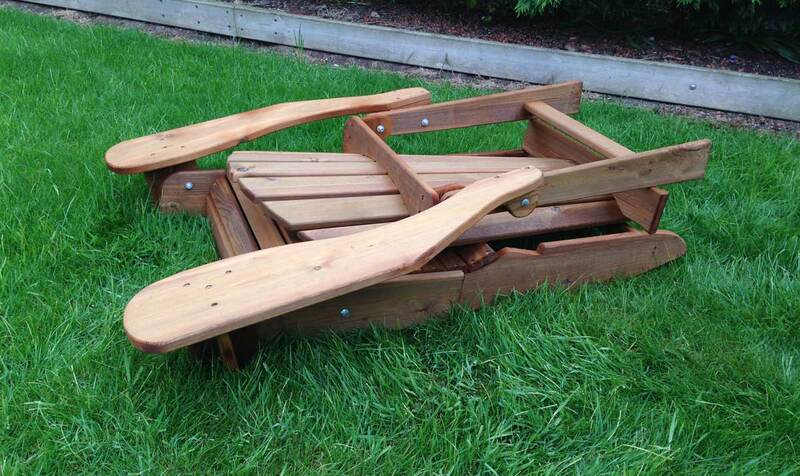 Will I need to treat my chair? All Chairs come treated with Tanalith. 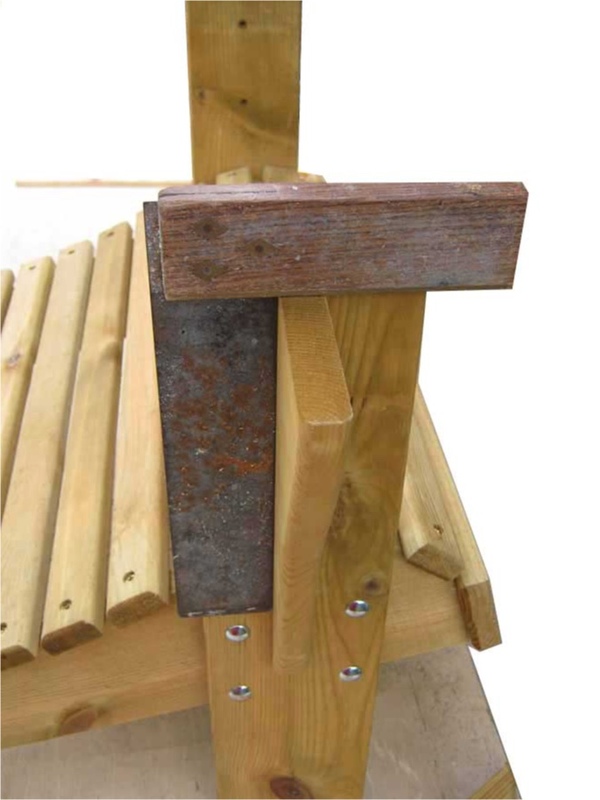 A rot proofer that will guarantee the wood from rotting for 15 years. If you would like to paint your chair please do so in the first year of purchase. The best paint I have found is Dulux Aquatech. It lasts and still looks good after 8+ years of weather. 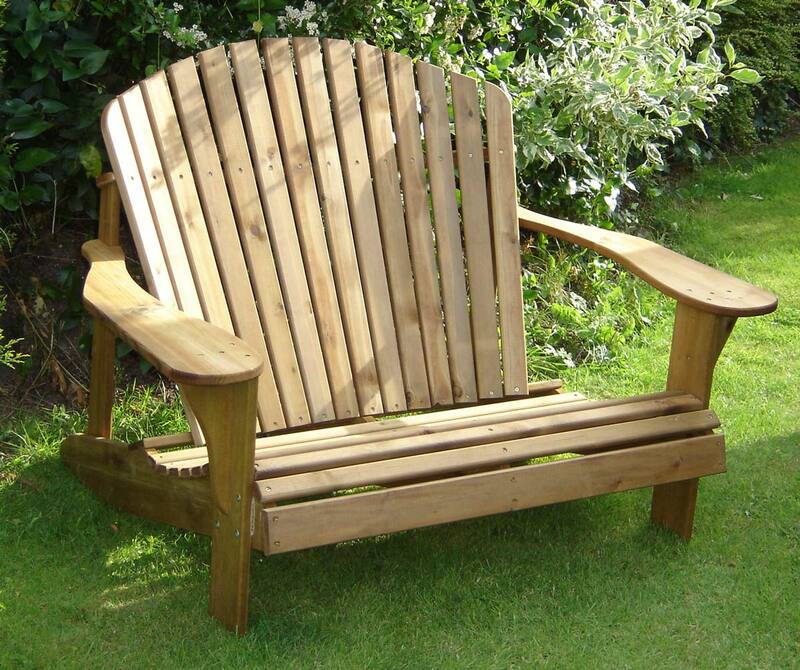 1ltr will paint 1 chair twice, which is recommended. Are the chairs alright to be left out over winter? Yes. The chairs will turn to a silvery/grey over 2/3 years where the sun is directly on them the most. The best way to clean your chairs is warm water and a sponge scrubbing pad. If they are really bad a jet washer is ok. The Returns policy does not include the chair plans. This is due to the item being easily copyable on a scanner or tracing paper. 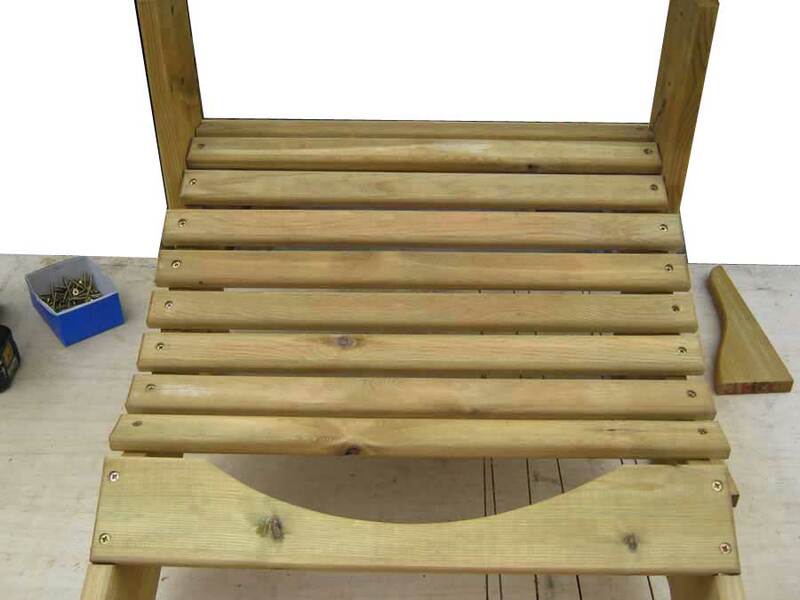 The Chairs/Kits are made from a living material(wood) and can only guarantee that the treatment used will prevent the chairs from rot for a minimum period of 10years. 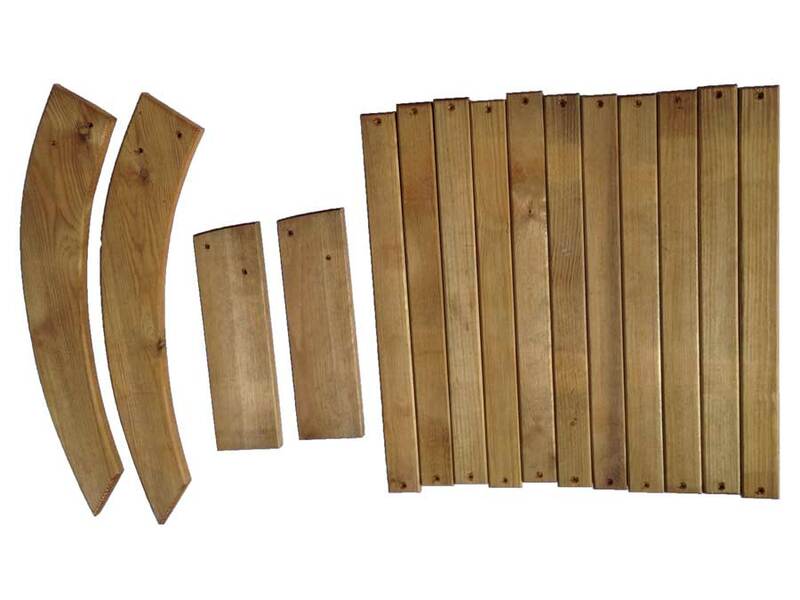 This does not include any hardware or the wood from splitting as this is a natural process made worse by leaving in direct sunlight when the product is new. The Chairs usually are not fully dry from the treatment when they arrive. 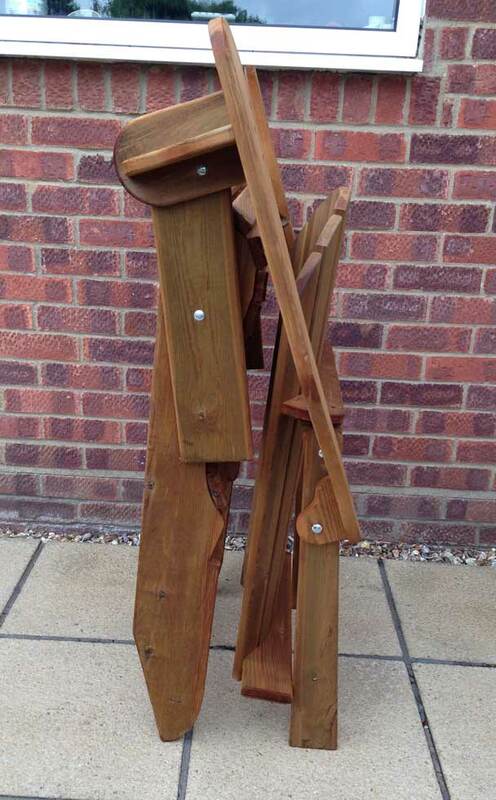 Please assemble the chairs as soon as possible and make sure they are dry before letting the sun force dry the wood. 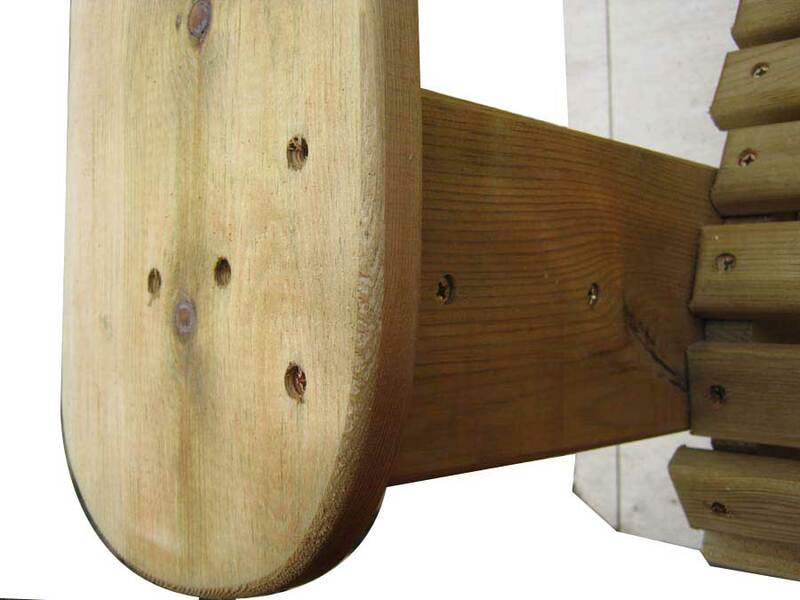 This causes the wood to split, when fully dry the wood is ok to be sat in direct sunlight.